On the 21st (Sat), have fun at Lock & Load Miami: Machine Gun Experience & Range. Here are some ideas for day two: wander the streets of Lincoln Road, identify plant and animal life at Shark Valley, and then browse the different shops at Bayside Marketplace. To see more things to do, other places to visit, reviews, and other tourist information, you can read our Miami trip planner . London, UK to Miami is an approximately 11.5-hour combination of flight and tram. The time zone difference when traveling from London to Miami is minus 5 hours. Traveling from London in July, you will find days in Miami are somewhat warmer (38°C), and nights are warmer (29°C). Finish your sightseeing early on the 24th (Tue) to allow enough time to travel to Wellington. Wellington is a village just west of West Palm Beach in Palm Beach County, Florida, United States. 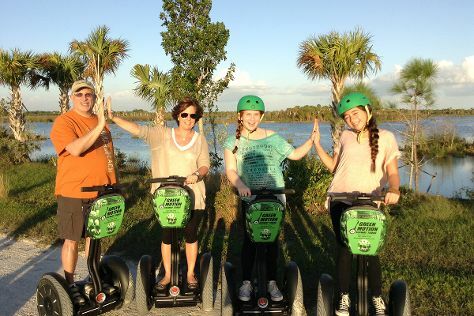 You've now added Green Motion Segway Tours to your itinerary. To see reviews, traveler tips, and tourist information, you can read our Wellington road trip website . Getting from Miami to Wellington by car takes about 1.5 hours. July in Wellington sees daily highs of 38°C and lows of 28°C at night. Wrap up your sightseeing by early afternoon on the 24th (Tue) to allow enough time to travel to Key West. Spend the 27th (Fri) airborne with a parasailing or paragliding tour. There's much more to do: look for all kinds of wild species at Key West Butterfly & Nature Conservatory, examine the collection at The Ernest Hemingway Home and Museum, immerse yourself in nature at Fort Zachary Taylor, and see majestic marine mammals with a dolphin and whale watching tour. To see reviews, other places to visit, ratings, and more tourist information, go to the Key West road trip planning website . Explore your travel options from Wellington to Key West with the Route module. In July in Key West, expect temperatures between 37°C during the day and 31°C at night. Finish up your sightseeing early on the 27th (Fri) so you can travel to Tampa. Start off your visit on the 28th (Sat): find something for the whole family at Busch Gardens Tampa Bay. To find reviews, traveler tips, ratings, and tourist information, read our Tampa trip planner. You can fly from Key West to Tampa in 3 hours. Other options are to do a combination of ferry, taxi, and bus; or drive. Expect a daytime high around 38°C in July, and nighttime lows around 28°C. Wrap up your sightseeing on the 29th (Sun) early enough to drive to St. Augustine. SAINT AUGUSTINE | PONTE VEDRA on Florida's Historic Coast The Nation's oldest city (est. Start off your visit on the 29th (Sun): pause for some photo ops at Castillo de San Marcos and then enjoy the sand and surf at St. Augustine Beach. To find where to stay, more things to do, and other tourist information, go to the St. Augustine online tour itinerary maker . Traveling by car from Tampa to St. Augustine takes 3.5 hours. Alternatively, you can do a combination of flight and bus; or take a bus. In July, daily temperatures in St. Augustine can reach 38°C, while at night they dip to 27°C. Finish your sightseeing early on the 30th (Mon) so you can drive to Orlando. Pack the 30th (Mon) with family-friendly diversions at Walt Disney World Resort. Have a day of magic on the 3rd (Fri) at Magic Kingdom Park. There's lots more to do: get in on the family fun at Universal's Islands of Adventure, look for gifts at The LEGO Store, make an unforgettable trip to Happily Ever After Fireworks, and try out the rides at SeaWorld Orlando. For maps, reviews, traveler tips, and other tourist information, use the Orlando trip itinerary planning tool . Getting from St. Augustine to Orlando by car takes about 2 hours. Other options: take a bus. Expect a daytime high around 38°C in July, and nighttime lows around 28°C. Wrap up your sightseeing on the 3rd (Fri) to allow time to travel back home.